Are you a brand new art teacher looking to get started teaching fast? This essential Bundle toolkit offers you 7 art lessons for grades K-6 that are easy to do, requires basic supplies and can be adapted for different grade levels. PLUS, it’s not just about teaching art…you need to know how to manage a class, plan your curriculum and order supplies. This package includes 5 BONUS guides will get help you teach like a pro! 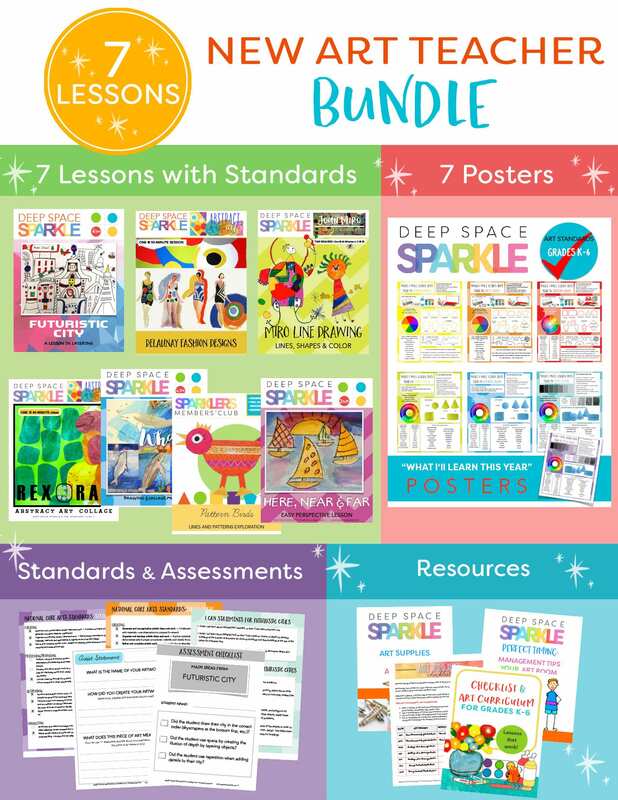 This product features 7 easy art lessons (K-6) that are perfect for a brand new Art Teacher PLUS 5 additional art resources to use in your classroom. Each lesson includes Common Core Standards, I Can Statements, National Visual Arts Standards Checklists, plus a quick Assessment checklist. ****DO NOT PURCHASE THIS BUNDLE IF YOU ARE A SPARKLER. It is included in your membership! Want to access over 100+ lesson plans for a low monthly fee? Join the Members’ Club!
. It was a computer problem and not a Deep Space Sparkle problem. I love the clear directions and the well planned ideas. Thanks for the great service. Sorry for the previous review. No problem! Glad you got your Toolkit. Enjoy! How do you access this as a Sparkler? ****DO NOT PURCHASE THIS BUNDLE IF YOU ARE A SPARKLER. It is included in your membership! Thanks!